Definition at line 55 of file netbios.c. Definition at line 63 of file netbios.c. Referenced by nbCancel(), nbDispatch(), nbReset(), nbShutdownAdapter(), and NetBIOSRegisterAdapter(). Definition at line 64 of file netbios.c. Referenced by nbCall(), nbInternalHangup(), nbReset(), nbShutdownAdapter(), nbSStat(), and NetBIOSRegisterAdapter(). Definition at line 57 of file netbios.c. 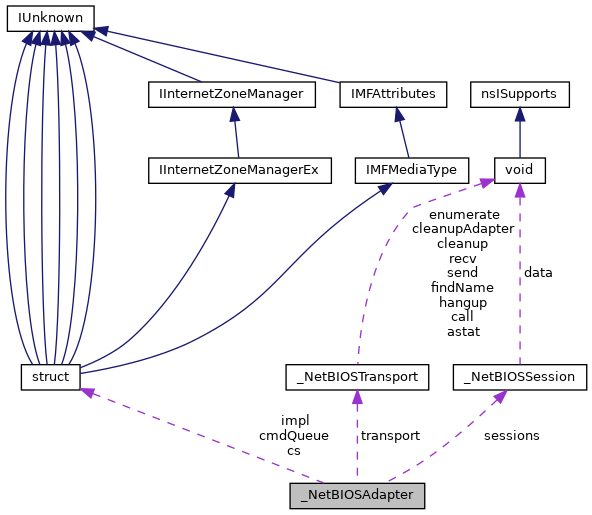 Referenced by nbInternalEnum(), NetBIOSEnableAdapter(), and NetBIOSRegisterAdapter(). Definition at line 62 of file netbios.c. Referenced by nbAStat(), nbCall(), nbDispatch(), nbInternalHangup(), nbRecv(), nbSend(), nbShutdownAdapter(), NetBIOSEnumAdapters(), NetBIOSRegisterAdapter(), and NetBIOSShutdown(). Definition at line 59 of file netbios.c. Referenced by nbReset(), and Netbios(). Definition at line 66 of file netbios.c. Referenced by nbCall(), nbCancel(), nbHangup(), nbRecv(), nbReset(), nbResizeAdapter(), nbSend(), nbSStat(), and NetBIOSHangupSession(). Definition at line 65 of file netbios.c. Referenced by nbAStat(), nbCall(), nbCancel(), nbHangup(), nbRecv(), nbReset(), nbResizeAdapter(), nbSend(), nbSStat(), and NetBIOSHangupSession(). Definition at line 58 of file netbios.c. Referenced by nbShutdownAdapter(), and Netbios(). Definition at line 61 of file netbios.c. Referenced by nbAStat(), nbCall(), nbDispatch(), nbEnum(), nbGetAdapter(), nbInternalEnum(), nbInternalHangup(), nbRecv(), nbSend(), nbShutdownAdapter(), NetBIOSEnableAdapter(), NetBIOSNumAdapters(), NetBIOSRegisterAdapter(), and NetBIOSShutdown(). Definition at line 60 of file netbios.c. Referenced by nbGetAdapter(), NetBIOSEnumAdapters(), and NetBIOSRegisterAdapter().